Whether you are recovering from an injury, preparing for an intense workout or just simply winding down after a long day at work, you will need a massage chair that can supercharge your daily ritual. The Human Touch Novo XT2 massage chair is the one that can give you the custom-tailored experience you need. It was built and designed to provide you with a therapeutic massage that can be personalized to fit your lifestyle, whatever it is, so that you can feel and be your best. When it comes to ease of use, there is nothing to worry about with the Novo XT2. It comes with an advanced LCD remote to help you easily manage the chair's full suite of programs and features. The remote has a crystal-clear LCD screen and an intuitive navigation control that lets you create a personalized massage program with easy-to-navigate customization. With just a touch of a button, you will automatically defy gravity as the chair moves you to an optimized neutral position to experience a zero-gravity massage. Doctors say that this position is the healthiest way to sit because it cradles your back and elevates your legs above your heart, which helps improve your circulation. It also naturally decompresses your vertebrae, allowing your spine to relax and rejuvenate. Your breathing also becomes deeper and more relaxed because this position helps expand lung capacity. The Novo XT2 allows you to indulge in 35 auto-wellness programs. This includes full-body immersion, deep tissue massage and a collection of therapeutic relaxation and recovery programs. Aside from that though, this chair also allows you to create a personalized massage program by choosing among 5 different massage intensities, 5 Cloud Touch acupressure massage intensities, 6 full-body massage speeds, and 3 foot massage speeds, plus adjustable width and targeted massage focus options. The 5 massage intensities can be adjusted to give you a fully enveloping massage with the right pressure. This is made possible by its Flex 3D Massage Technology. Its Cloud Touch Acupressure feature applies pressure to key healing points, via strategically placed air cells, to manipulate your body to stretch the muscles. The chair also has an expansive "bend and stretch" functionality that provides unprecedented leg and spine relief. This increases your blood flow to the vertebrae and discs and rejuvenates your lower back, allowing you to recover with greater efficiency. Its extending foot-and-calf massager has under-foot rollers for optimized reflexology and adjustable intensity for your calves and feet. Height is also not an issue with this chair because it has an extendable leg rest that automatically adjusts for your height. Other massage chairs only feature either an S-Track system or L-Track system. However, the Novo XT2 provides you with the benefits of both. The L-track of the HT Novo XT2 provides high-performance coverage from your neck and shoulders all the way down to your glutes and thighs. The S-track system, on the other hand, closely follows the curvature of the spine. This results in a massage designed to move with the natural curves of your body for optimal results. Music is said to soothe the soul. Why not combine that with your luxury massage? You can immerse yourself in the melody of your favorite music with the chair's built-in Altec Lansing premium sound system that allows you to connect your phone or music device to the speakers via Bluetooth. Alternatively, you can choose to listen to eight calming built-in nature tracks or even a narration or demo walk of the chair’s features and health benefits. Aside from the Human Touch XT2's main features, you can also enjoy the added benefits of dual lumbar heat. It provides an adjustable and targeted heat that gently soothes your back to loosen tight muscles and help relieve back pain. The Novo XT2 3D also features a space-saving design that requires only 2" of wall clearance in order to pivot seamlessly from an upright to a reclined position. The Novo XT2 can provide you with numerous benefits. Its expertly designed massage programs can help your body recover from a variety of physical conditions such as back pain or arthritis. It can help athletes prepare for or recover from strenuous workouts. It can help your body restore by correcting daily strains from your modern life such as tension headaches. Plus, it can help you rejuvenate by improving your mental focus and overall health by giving you a greater sense of well-being. The Novo XT2 is available in 5 colors - black, red, gray, cream, and espresso and comes with FREE shipping and indoor setup & assembly so you can start enjoying it in a breeze. 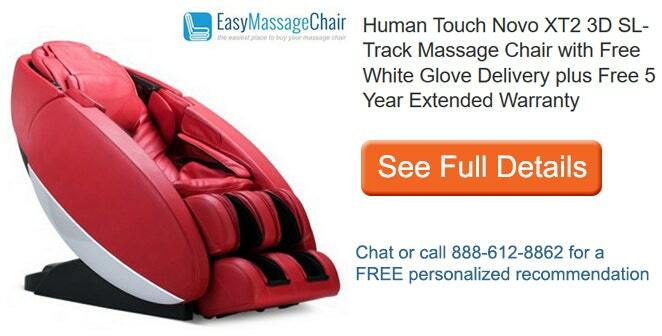 There's also a 5 year warranty included for this premium massage chair. 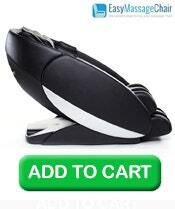 Give us a call now at 888-612-8862 if you have any questions or click the add to cart button if you wish to purchase. FAQ: Where Can You Try A Massage Chair Before Buying? Titan Pro Jupiter XL vs Osaki OS-4000T: Which Chair Is Right For You? FAQ: Do We Accept Returns?